Betty Kuntiwa Pumani is the daughter of the late Milatjari Pumani and the younger sister of Ngupulya Pumani. Betty was born and raised in Mimili, in the Southern Desert region, where she continues to live. Pumani is a recognised Ngangkari (healer) and worked as a teacher at Mimili Anangu school before starting to paint at Mimili Maku art centre in 2007. 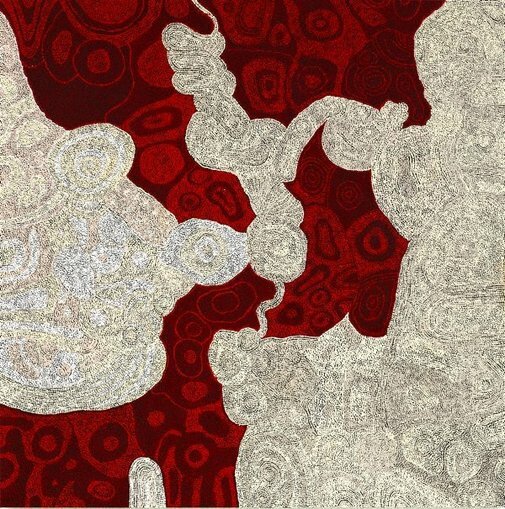 'Antara' 2014 depicts Pumani's mother's country of Antara, a site north-west of Mimili community which is extremely important to Pitjantjatjara people. It holds many Tjukurrpa songlines that cross this area of country and has an important rockhole where women perform inmaku pakani, a dance ceremony related to the maku (witchetty grub). The natural features of the surrounding landscape, the rocks, rockholes, creeks and mountains are also included in the work.